Not all of your small business gets tackled online, a lot of it will be done working with your hands. Your our own garage workshop is the foundation of your business. Instead of having to outsource fix-it problems, you can solve them right from home base. This garage workshop guide will run you through some layout ideas, must-haves, and offer a few creative solutions you can mess with on your own. For how to professionalize your space, keep reading. This is broken up into two sections. The first is establishing your workspace and making sure that it's ready to tackle those big projects. The second is on some creative liberties you can choose to incorporate at your own convenience. Put your tool belt on, because it's time to hammer away at some stuff! The first step is to get organized. This is going to range from your cabinets to your walls, to where you put your leftover screws. When building your garage workshop, start with dedicating wall space to hang tools on. You can call it your "tool wall" or "gear wall." We recommend some sort of pegboard. This allows you to create a customizable layout depending on what tools you need to hang up. Hanging tools on your walls allow you to survey what you have at a mear glance, saving you the hassle of riffling through cases. This helps your organized workshop, stay organized. Designating one or two walls should suffice. Make sure clutter isn't making a home at the base of the wall(s) because having to stretch for your tool of choice is never a good idea. That also means don't put something high above your reach. Your tool wall should never require you to get a ladder. All your screwdrivers, wrenches, clamps, vise grips, caulk guns, steel strapping tools and so on should have a home too. Often theirs won't be on the tool wall -- that's for things like power tools. They should be shelved in their cabinetry homes. We recommend having a tool cabinet with some sort of drawers. A pro tip is to then tear a piece of scotch tape to label those drawers. Sliding open ever single drawer because you keep forgetting where you put that one tool can get annoying. Labeling will save you from that. Your tool cabinet can also serve as a workbench, as most of them offer integrated options. A brand we'd recommend would be something like Husky, Dewalt, or Milwaukee. Something that uses steel so it can handle your projects. Be careful of the steel you buy though, as some steels aren't up for the job. 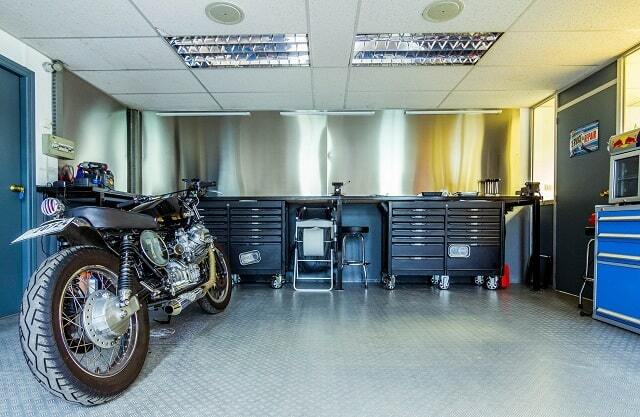 For more about what steel to use in your garage workshop, we've done some research for you. Once you do have your workbench in place, it's nice to have a few key things on it. There are small tools and parts that will belong right out in front, not tucked away in the big shelves. For these, we recommend some sort of mini shelving unit -- make sure it's clear though. Putting a clear pull-out-drawer on your workbench allows you to snag or put away spare screws, nuts, bolts, washers, twist ties, and all those other things that would otherwise fall to the floor. Having your workbench organized for quick, easy access of parts will save you time and a headache. There's nothing worse than rummaging through drawers to find one screw or washer to complete your project. Don't overspend on things you can create on your own. You're a builder! There are multiple modifications you can make to your garage workshop that will speed up your processes and save you from headaches. Take some creative liberty in these ideas and how you want to incorporate them. If you come up with something cool, feel free to share it with us! It's like a jumbo paper towel roller attached to your workbench. Let's say you're doing that messy job with lots of glue and chiseling and hammering. You want to protect your workbench cover from scratches, globs, and dents, right? Although paper won't shield from you swinging directly on your bench, it will lessen the damage. And it will for sure save the bench from scratches and glue globs. Attaching a makeshift roller will preserve the investment you made. It also makes your small business space more official, organized, and reusable a hundred times over. We've all got butterfingers. It's just part of being human. You're going to drop, lose, and have to go on the hunt for washers, screws, and bolts, why not make the task a little easier. By attaching a magnet (or a few) to the end of a broomstick or other extendable, you'll have a much easier time snagging that lost piece. Think of all the back pain you'll avoid! These are also great for doing a garage sweep when you're done. If your parking a car in your garage workshop, you'll want to make sure you sweep this broom near tires and other things that could deflate at nail contact. Clean air is good air, but purchasing a high-end ventilation system is a pretty serious investment. For a simple solution that'll work in most garage workshops, we recommend hanging up a box fan and placing a furnace filter in front of it. This will help trap bad air (especially when sawing wood or grinding metal) while keeping air moving in your shop. We recommend changing these filters at a minimum of every six months. If you're looking for more ideas on how to add or transform your garage workshop or small business, subscribe to our blog. If you have a tricky problem on your hands or want to see an article on a topic not already discussed, feel free to reach out and contact us. We'd love to help you build your small business even further!